The first mass production units of Sagem Wireless’ new NFC Cosyphone will begin shipping later this month and a few pre-production models are now in the hands of developers, partners — and NFC World. COSYPHONE: The new de-facto face of NFC — at least for the next few months? Sagem Wireless has put the NFC-enabled Cosyphone it announced earlier this year at the Mobile World Congress into production. The phone uses Inside Contactless‘ MicroRead NFC controller chip and is compliant with the Single Wire Protocol (SWP), allowing the SIM to be used as the secure element. The phone meets all current NFC Forum standards and supports both the JSR257 Contactless Communications API for tag reading/writing applications and the JSR177 Satsa API for secure communications between the SIM and the baseband processor. Shipping of the first 2.5G Edge mass production units will begin during the second half of September with both a software development kit and a 3G version of the Cosyphone to follow in October. The Cosyphone has been specifically designed to meet the needs of two target markets that have an overlapping need for simplicity. The first is the over 50s, described by Sagem Wireless’s NFC product line manager Cyril Caillaud as ‘active seniors’. 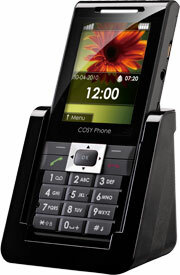 For this group the Cosyphone provides large keys, large screen fonts and a straightforward user interface. And, as an aid to those whose hearing may no longer be perfect, the phone also vibrates, rather than beeps, to indicate an NFC transaction or operation has been successful and the phone also includes a Hearing Aid Compatibility (HAC) option. The second target market is ‘pragmatic users’ of B2B applications. Here, the phone’s easy-to-learn user interface, a built-in LED torch, robust charging cradle and A-GPS functionality are designed to simplify the process of getting security staff, carers and other remote workers to report back to base by reading tags whilst making their rounds or visiting customers. All units will also ship with a selection of NFC tags in the box. These are supplied as labels with a wipe clean surface, allowing users to easily annotate each tag and then wipe it off and re-label whenever they want to re-program it. The Cosyphone is designed to be sold through mobile network operators and other companies, who will be able to put their own branding on it. It will also be available direct from Sagem Wireless in quantity and via its international distributors. The large NFC antenna is located on the inside of the battery cover, so in use it is very close to the tag and as far as possible from the phone’s internal circuitry. This makes tag reading and writing quick and easy although, Caillaud tells us, the reading/writing distance and speed will vary according to the type of tag used — our phone came with a selection of Innovision’s Topaz 512 byte tags. We were surprised to find the phone doesn’t recognise Mifare Classic tags or our Nokia 6212 NFC phone. “That is because, although the Cosyphone is fully compatible with NFC Forum standards, Mifare Classic isn’t — although support for Mifare Ultralight or Ultralight-C is part of the standards and the Cosyphone does support them,” Caillaud explains. Without an NFC SIM we can’t test the phone in card emulation mode. The Cosyphone is, however, currently being performance tested in an independent lab and their results should be available soon. For now, Caillaud will say only that “we’re happy” with the phone’s performance. The phone has a solid, high quality look and feel and, although it’s aimed at their grandparents, my children are fighting over who gets to take it to school so they can be the first to demonstrate NFC to their friends! NFC begins to get the attention of the mass market — but will it be a help or a hindrance?